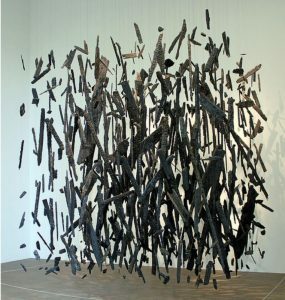 I respond to art that simultaneously takes me both outside myself and more deeply inward. 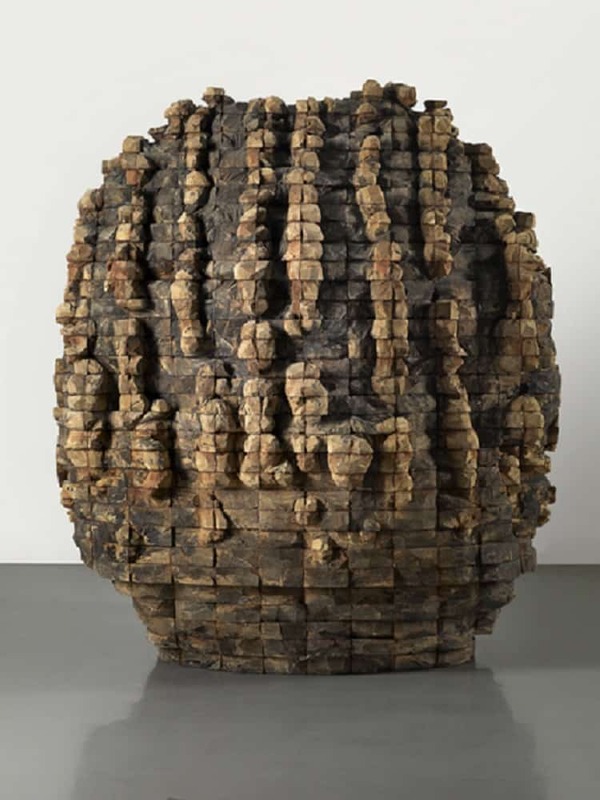 Though I respect work that is intellectually stimulating alone, the art that most engages me occurs at a physical level and insistently penetrates through the defenses erected in this over-stimulated world, landing squarely in the gut. It commands concentrated attention and may lead to a temporary disorientation, followed by a stilling within. 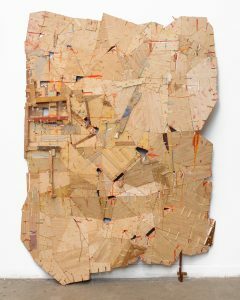 While the work is usually conceptually based, it’s the materials—embedded with a physical and symbolic history and showing evidence of the artist’s hand—that most call to me. 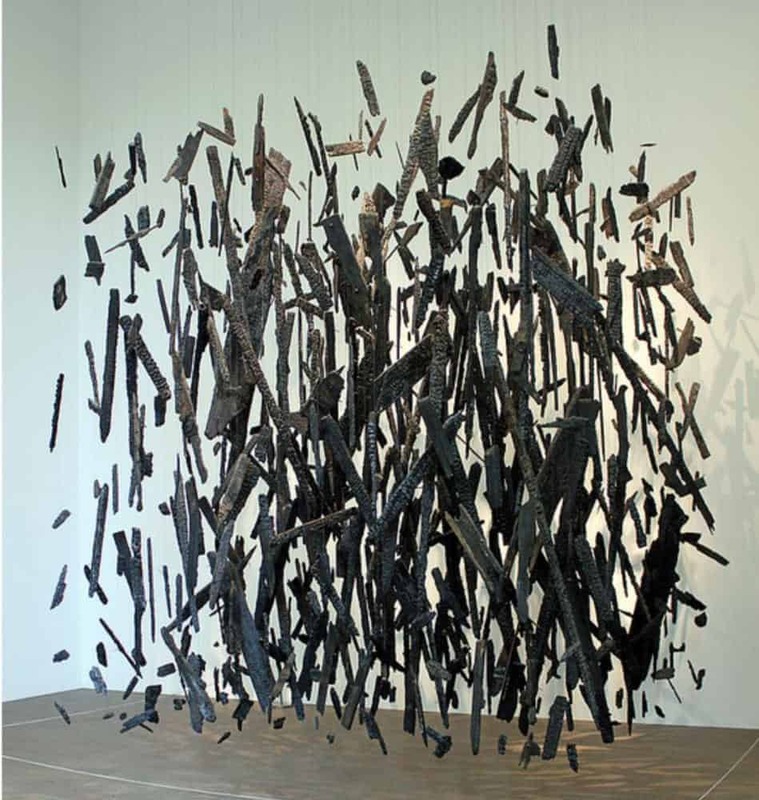 In this curation I imagined certain immersive spaces interspersed with rooms of sculpture and wall work. 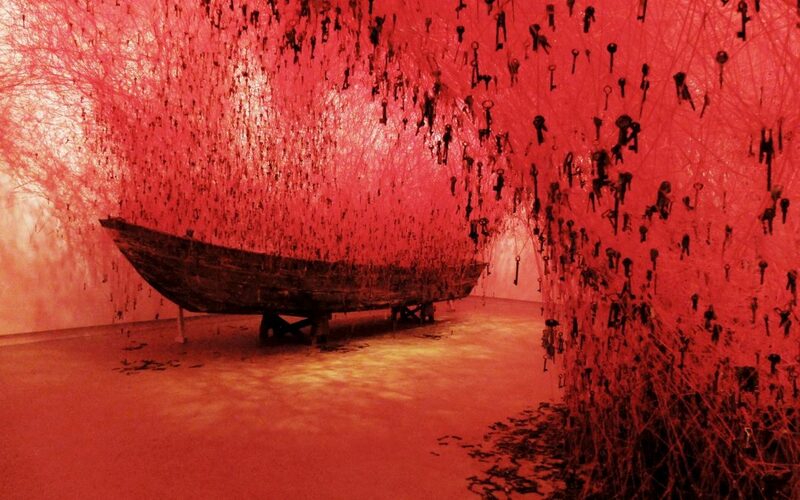 Chiharu Shiota’s thread-based installations (top) create beautiful, unsettling spaces and investigate the themes of memory, human life, desire, connection, and absence. 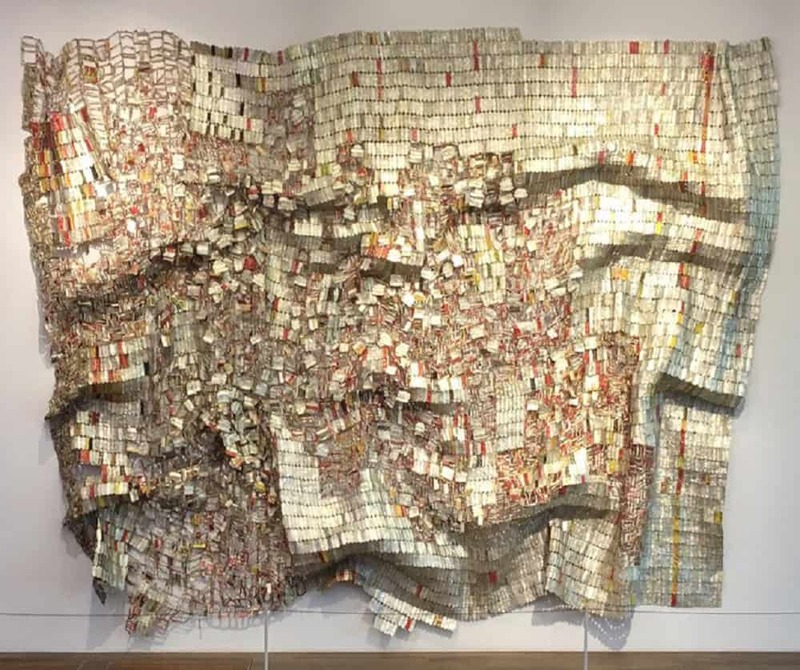 Visitors will emerge from this piece into a room where one of El Anatsui’s woven “bottle-seal” tapestries spills toward the floor. 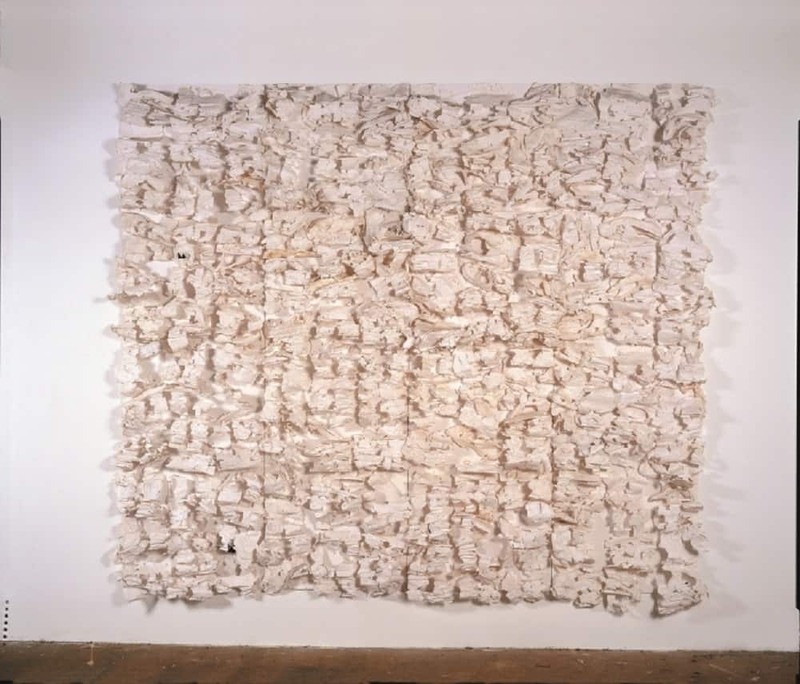 Air currents gently rock the luminous sculpture, so viewers can listen to it as it winks across the room to a series of Yoshiaki Mochizuki’s gesso, clay, graphite, and metal-leaf reliefs. Layered, the surfaces gleam from matte to a subtle shimmer, and as light plays across the surface and one’s attention narrows, the imperfections of the hand-incised drawings are revealed. 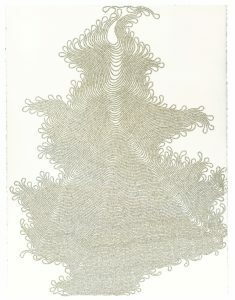 Meg Hitchcock’s elegant and lyrical drawings, upon closer inspection, reveal passages from certain religious texts spelled out to reference another faith entirely. They form a quiet counterpoint to Sati Zech’s vibrant and powerful assemblages. 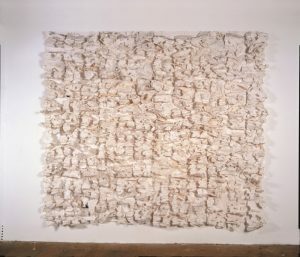 Created from painted, ripped, and sewn canvas and paper, these speak to the communication and connection between people beyond spoken language. 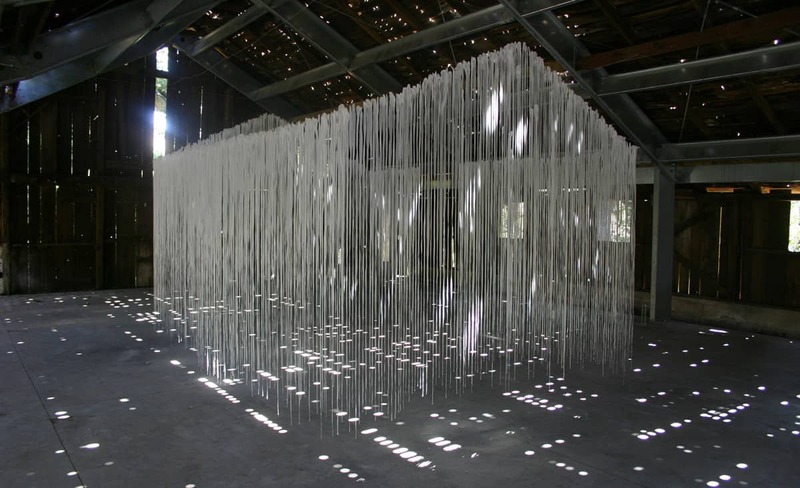 Lastly one wanders into a room filled with Belie Liu’s piece, Recall, made up of of 600 five- to eight-foot handmade paraffin strips in the form of a house (below). Light filters down, shifting and scattering as the piece whispers; speaking to loss and resiliency, the fragility of family, of shelter, of home. 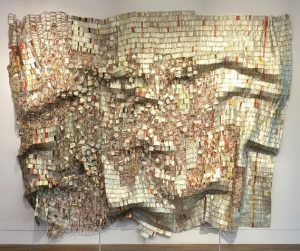 It is a fitting end to an exhibit addressing all these themes in a myriad of ways. These works haunt, seize the heart and mind, causing me to see differently, inhabit the world with a greater awareness to the connections among and between us all. What more could one ask? 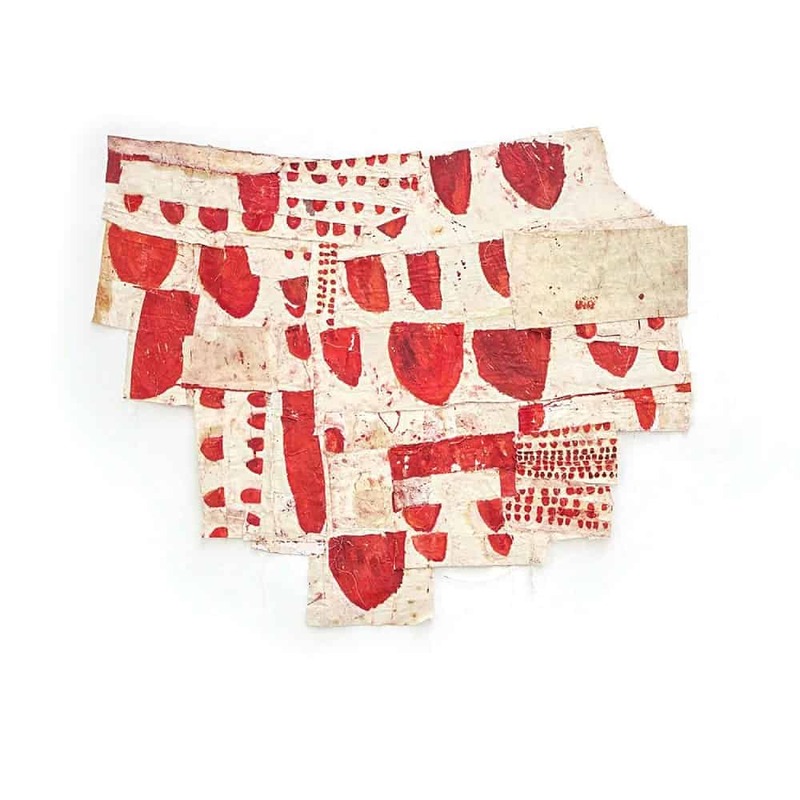 Christine Aaron is a mixed-media artist who uses printmaking, wax, wood, metal and paper to create work investigating memory and the fragility of human connections. 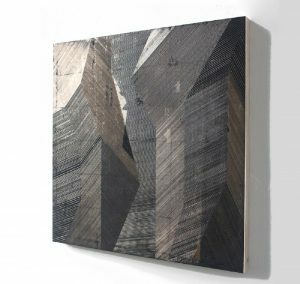 She has exhibited nationally and internationally, and is represented by Kenise Barnes Fine Art in Larchmont, NY, and James Gallery in Pittsburgh, PA. Aaron lives and works in Westchester County, NY. Wow! What a fantastically fabulous show this would be! Congratulations to Christine and to you, Ann, for making this conception a little more real. The most gorgeous and engaging work I’ve seen in a long time. Congratulations to the artists! Wonderful article by Christine Aaron. What a meaningful and insightful curation. Very nice beautiful work all very interesting! Great article Christine, big congrats to you! Beautifully Done….cmCongrats and Kudos Christine. Wow, you captured what speaks to and engages me, some of my favorite, most inspiring artists, and the why. Beautifully expressed in words, and photos. You took me there, thank you! Thank you Nancy, Astrid, Mitchell, Debra, Kathy, Elise, Niamh and Lisa! I really enjoyed putting it together and the hardest part was editing it down. Could have written this much about each artist easily. Aren’t they wonderful? This is so wonderful, Christine! I loved how you described each piece. Amazing artists! Congratulations! Christine, this is extraordinary in all ways – the art itself, the overall curation, and your insightful and beautifully articulated words. I wish I could see this exhibit! Congratulations. 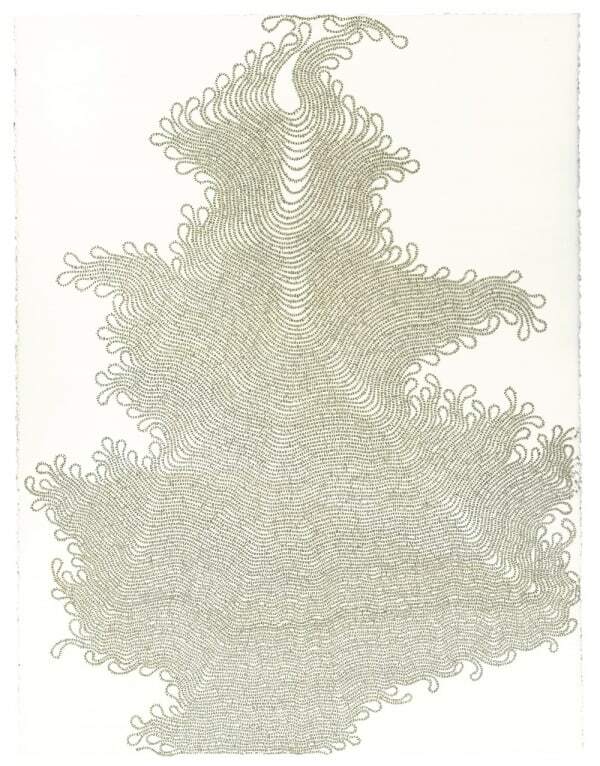 Christine, wonderful project, intriguing art, and beautiful commentary. Congratulations!